Cargo insurance details are not always considered a priority in the complex world of global scale hospitality projects. The assumption is that the minimum standard coverage required by regulation is sufficient. But adequate coverage plays a crucial role in the transportation of high value FF&E shipments, and how a logistics firm insures your cargo should be a key decision factor when choosing a provider. Many logistics providers suggest cargo insurance is an either/or question. They offer one or the other, based on subjective analysis of which model offers the best potential value. While both methods have real benefits, HLI recognizes that the standard practice of offering a single type of coverage may not deliver desired results. HLI does not limit protection by choosing one insurance model over the other. We carry an additional Freight Forwarder umbrella policy, which creates a second line of defense by providing extra coverage for all shipments. The dual cargo coverage HLI provides is not a standard level of service in the hospitality industry. This service highlight provides substantial value for our clients by synergizing complementary models to create complete protection. Why do I need additional insurance if the carrier is already providing coverage? Carrier coverage has a cargo insurance coverage limit. Per FMCSA regulations the minimum coverage requirement is $100K, without exclusions or restrictions. There are certainly transportation incidents with claim values as low as a few hundred dollars, and these fall well within carrier coverage limits. HLI’s additional coverage is critical for the protection of client interests when shipping accidents damage goods valued at many hundreds of thousands of dollars. Can all logistics providers offer this additional insurance? No. 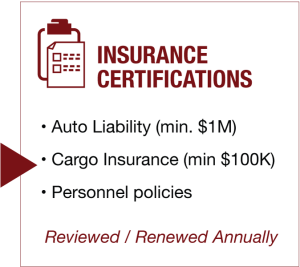 Per FMCSA regulations, only companies with a freight forwarder’s license can offer cargo insurance on a separate policy. Logistics providers that only hold a broker license cannot carry the additional policy. 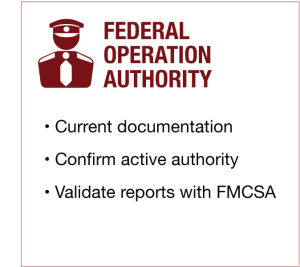 HLI holds an FMCSA Freight Forwarder License. This allows us to carry the additional policy and offer Freight Forwarder coverage in addition to standard Carrier Coverage. When is the additional coverage included? All shipments are insured through carrier coverage, which all of our carefully vetted transportation partners are required to provide. The additional umbrella coverage feature is included on any project for which HLI fully manages the transportation logistics. The full insurance value for each load is specified on every carrier agreement. Shipments are insured directly with carrier coverage up to the limit stated in the carrier agreement, usually $100K. In the event an issue arises that falls outside the parameters of carrier coverage, the HLI umbrella policy provides additional protection. What is the claim process and timeline? HLI files claims on the client’s behalf directly with the carrier. The timing of carrier claims processing varies, but averages up to 9 months. If the carrier claim is denied or delayed, or there are further catastrophic or complicating circumstances that take the claim beyond the carrier’s coverage limits, HLI then files a claim with our insurer. The timeline for this varies depending on the complexity of the claim, but averages up to 45 days. When does the additional coverage take effect? HLI’s additional coverage takes effect in the event a claim is denied by carrier coverage, or if there is a further complicating or catastrophic situation. Four shipments of pattern matched carpet shipped on four trucks. One truck was in an accident and the carpet was damaged. Because it was pattern matched, all four loads of carpet were then unusable. The carrier coverage only extended to the one roll of carpet damaged in the one truck that was in the accident. But, all four carpet rolls were a total loss for the client, as the entire carpet order had to be remade completely. HLI’s umbrella policy covered the additional loss of the 3 rolls of undamaged, but still unusable carpet. How reliable are the carriers and their coverage? HLI has a very stringent carrier partner qualification policy. Truck asset owners and brokers are thoroughly vetted through our rigorous carrier approval process, and if they meet our highly selective standards are required to sign our extensive Carrier Agreement designed to protect the interests of our clients and their high value cargo. We review these factors for all potential carrier partners to determine if they qualify to be a part of our network. Potential carrier partners who meet these criteria are validated in our system. 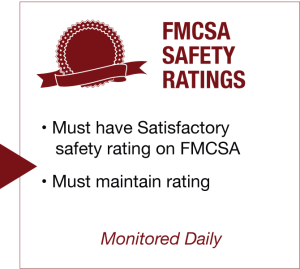 Active carrier partners who maintain their standing are revalidated annually. Potential carrier partners who meet these criteria are validated in our system. Active carrier partners who maintain their standing are revalidated annually. Contact us today to discuss transportation for your next FF&E project and start enjoying the convenience and security of dual protection, all risk coverage.